The workshop was attended by 12 open source enthusiasts. Following an interesting discussion on the issues surrounding propriatory software in education and the possibilities offered by open source software, the contributors had a chance to try GNU/Linux on their own laptops. An agreement to extend the group's activities was taken and we hope that a second workshop will soon follow. And Nicholas Pickwoad, director of the Ligatus Research Centre (University of the Arts, London) drew on the history of bookbinding to set out “a really good reason to preserve real books”, since the “material object has locked up within it… a significant part of the history of the book, much of which is not accessible by other means”. Professor Pickwoad is presenting 'Giving Support on The Shelf: The History, Development and Construction of The Book Shoe', the first in a selection of seminars taking place to celebrate 21 years of Conservation By Design. On Thursday, 11 April 2013, Professor Pickwoad took part in the presentation at the Bijzondere Collecties of Amsterdam University Library of the discovery of two leaves from a lectionary written in about 860 in the royal scriptorium of Charles the Bald, King of the West Franks. Professor Pickwoad found the leaves last summer on the binding of a copy of Jean Calvin, 'In viginti prima Ezechielis Prophetæ capita Prælectiones', Geneva: ex officina Francisci Perrini, 1565, whilst searching for books to use in teaching his course 'European Bookbinding 1450-1830' for the Bijzondere Collecties Summer School. By great good fortune, Professor Rosamond McKitterick was teaching on the summer school in the same week, and she was able almost immediately to identify the date and origin of the leaves. Twelve manuscripts are known from this scriptorium, and these leaves are evidence of a hitherto unrecorded thirteenth manuscript, probably written for the royal chapel itself. Most unusually, the leaves were treated with great respect by the binder, who arranged them to show the decorated frames and gold lettering on bands of purple complete and symmetrically on the binding. A full account of the manuscript leaves by Professor McKitterick and of the binding by Professor Pickwoad will be published in the next issue of 'Quaerendo', due out this summer. Registration for Ligatus Summer School 2013 is now open! We are now taking applications for this year's Summer School at Uppsala, Sweden. Please visit www.ligatus.org.uk/summerschool for more information about the programme and fees. Ligatus is conducting a new project, which aims to create an online tool for describing decorated papers. This tool is designed for non-specialists who wish to identify decorated papers found in/on books without having to rely either on written descriptions of such papers or having to attempt to describe them themselves. 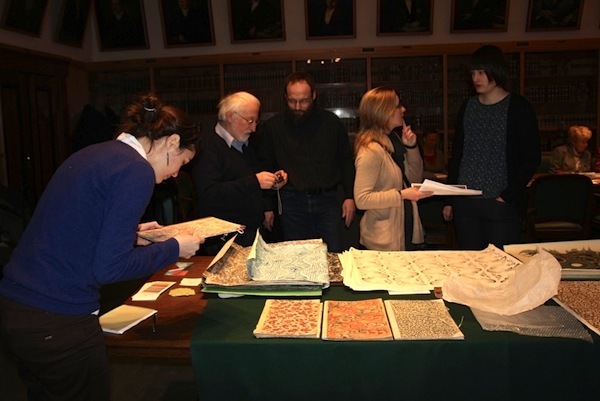 On February 22nd and 23rd, Aurelie Martin presented this project to the Decorated Paper Historians Group, during their annual meeting in Leipzig. This group, which has been meeting for the past ten years, convenes book and paper conservators, paper historians, librarians and decorated paper makers. Its focus is the study of decorated paper through various aspects such as the identification of techniques or the problem of terminology. The presentation in Leipzig resulted in a potential collaboration between Ligatus and some of the specialists of the group. We will continue to work on the website in the coming months and hope to go public with a preliminary version later this year. Professor Nicholas Pickwoad will be at the conference, John Baskerville: art, industry and technology in the Enlightenmentin Birmingham from 6-7th April. Contributing to the section, 'Baskerville and his products', Professor Pickwoad's lecture is titled: 'Books bound after what manner you please: English bookbinding in the mid-eighteenth century'. The exhibition entitled 'Piel sobre tabla', or in English, 'Leather on Wood' opens today at the The Biblioteca Nacional de España in Madrid. Focusing on Iberian Peninsula in the Middle Ages, where between 711 and 1609, Jews, Muslims and Christians shared a common space. 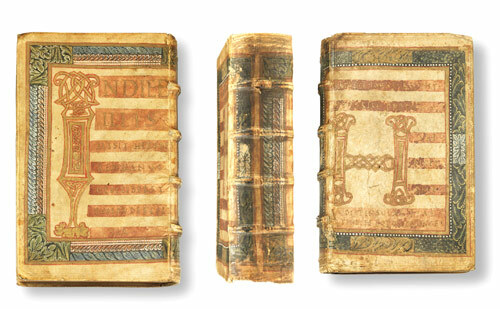 This exhibition demonstrates how this co-habitation led to the development of a binding style called Mudéjar, unique to this area of Spain, through the extensive range of examples in the library's collection. The exhibition runs from 12 March - 19 May, 2013. Join Ligatus and the rest of CCW Graduate School to find out more about Research Degrees at Camberwell, Chelsea and Wimbledon Colleges of Art & Design. The evening will be an opportunity to meet us, other staff and students involved with the research degree programme. You will hear a number of short presentations throughout the evening with an opportunity for you to network and ask questions. Information about funding opportunities will also be available. While it was long assumed that most books in the handpress era were sold in unbound sheets, this has been challenged by the suggestion that many, if not most, books were sold bound. However, the survival of significant numbers of books as sewn bookblocks without covers, and with or without boards, offers another possibility: that the booktrade offered books for sale in an incomplete state, ready to be completed whenever that may have been required. This lecture looks at the surviving examples, the evidence for the practice, and its implications for the history of bookbinding.